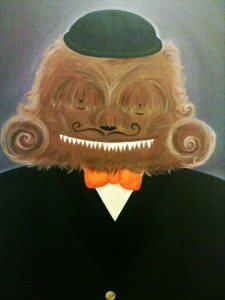 I have a new piece called The Life Story of L up at Freerange Nonfiction, along with a piece by Melissa Seley. Many thanks to the good Mira Ptacin. 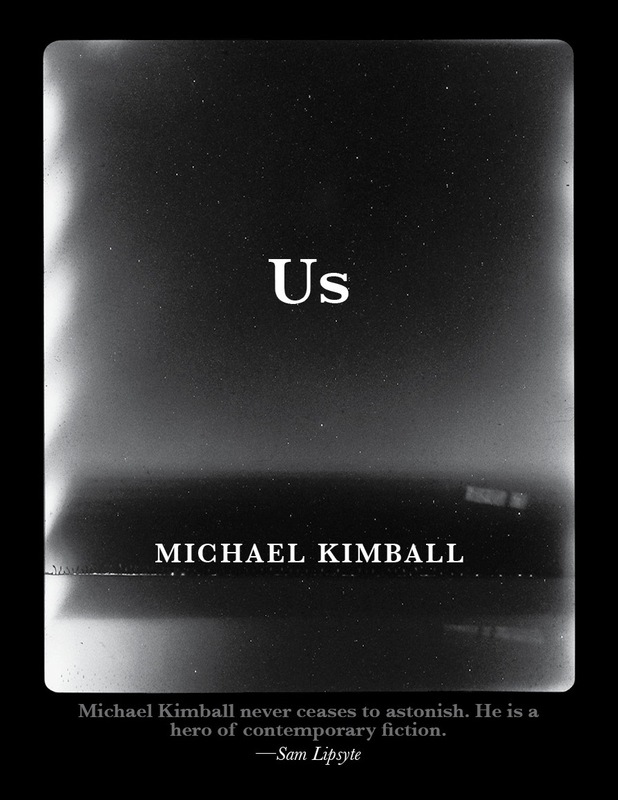 There's a really nice review of Us in Rain Taxi that says Us is "incredibly raw and unabashedly real ... Kimball wins us over by his impressive emotional authenticity. 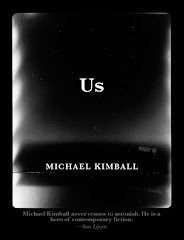 Us is so authentic that one might mistake it for an autobiography." 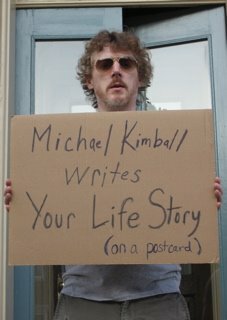 You can only see it in the print version of Rain Taxi or at Powell's Review-a-Day. Then there's this five-question, one-minute interview at Birdsong. And I missed this a couple of weeks ago, but there's a really sweet and thoughtful video review of Us at Momentary Melodies. Thank you, Lauren. My friend Jen Michalski asks me some questions about Big Ray over at JMWW -- for instance, how I wrote it without anybody knowing. I have an interview with Stephanie Barber up at The Faster Times. We talk about her show at the Baltimore Museum of Art, "Jhana and the Rats of James Olds or 31 Days/31 Videos," working under constraints, and how people approach art. More interviews @ The Faster Times: Gary Lutz, Blake Butler, Laura van den Berg, Brian Evenson, Robert Lopez, Dylan Landis, Padgett Powell, Sam Lipsyte, Dawn Raffel, Kevin Sampsell, Gina Frangello, Evan Lavender-Smith, Ken Sparling, Matt Bell, Ingrid Burrington, Andy Devine, and Jessica Anya Blau, Deb Olin Unferth, Blake Butler, Justin Taylor, and Susan Henderson. 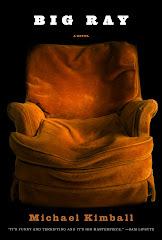 I'm interviewed at Used Furniture where we talk about Us, Dear Everybody, sadness and reckoning, euphoria and writing, and writing as something that is rendered. I have an interview with Rachel B. Glaster up at the Charlotte Viewpoint. We talk about Pee on Water, how her ideas become stories, and how anything can be a story. I'm having a pretty great year so far and I feel really grateful for it. I don't even know how to explain how grateful I feel. I'm so happy to announce that I just sold the world rights to a new novel, BIG RAY. It's the story of a son coming to terms with the sudden death of his obese father. It's told through 500 brief entries, moving back and forth between past and present, the father's death and his life, between an abusive childhood and adult understanding. 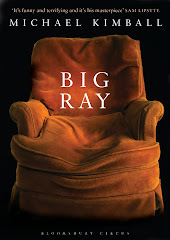 BIG RAY went to Kathy Belden at Bloomsbury USA, which will publish in Fall 2012, and Michael Fishwick at Bloomsbury UK, which will publish in Winter 2013. Oprah says some really nice things about Us: "The best little novel you haven't heard about, Us ... Kimball's clear-eyed prose unlocks the most vulnerable voice ... creating an emotional link that leaves no reader untouched." I've always loved Largehearted Boy and I had a lot of fun listening to everything song on my iPod to make a playlist for Us. There's Beck, Wilderness, Neutral Milk Hotel, Mazzy Star, The Cure, Celebration, and a cover of a Blue Oyster Cult song.